Why An Intimidator Is the Best Holiday Gift | Intimidator Inc.
It’s that time of year again…shorter days and cold, longer nights. Despite this, everyone’s happier as the holidays roll around, and the prospect of great gifts becomes a reality. Do you know a someone that you’d describe as an outdoors type; a rugged, hard-working but fun-loving iconoclast? If so, then our decades in the utility vehicle industry would bet that an Intimidator would be the gift of a lifetime for them. This American made beast is the definition of an all-purpose vehicle. With the variable number of seats, you can take a handful of friends out in this holiday UTV; or just one or two hunting buddies. And of course, there’s the pride of sitting in a chassis made out of American steel! Yes; you read that right. This new beast has an 800cc engine; which means that power is never in short supply for the drive train. 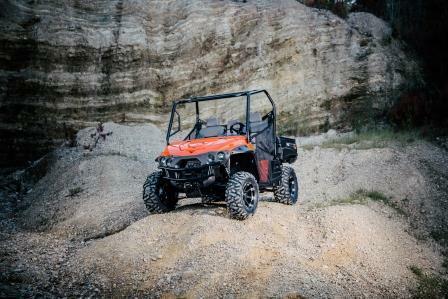 Made by the vehicle experts at our Batesville, AR location, this is our most powerful side by side UTV yet. You will enjoy merely revving the engine of the Intimidator, whether it’s for around-the-yard work, or a day off during these holidays for sport-driving in the dirt. As mentioned, there is an array of options that suit different prospective customers. There are accessories that optimize the cab better for hunting or farming; as well as amendments available in a custom build. For someone with a lot of close friends, the Intimidator Crew Series UTV would enable you to take up to 6 adults – including yourself – for an off-road ride. The Classic is a more personal affair, and seats 3 people. The sizable Truck Series is generally regarded as a working-class UTV, and would make a good holiday present for someone who frequently works the land. It seats 3 adults and has features tailored specifically for work. No matter which you opt for, it’ll make a holiday gift to remember forever, and provide endless fun! Download our Free Comparison Guide!